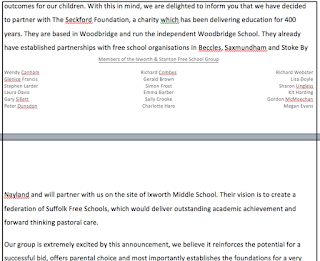 The Seckford Foundation appear to have learned nothing from their recent problems at Beccles. Not content with their involvement in the highly controvercial bid for a free school at Beccles as well as two more at Stoke-by-Nayland and Saxmundham it has been announced today that they are now backing the Ixworth and Stanton free school bid. But in a letter from the Ixworth and Stanton Free School group sent today by Stephen Larder a somewhat different vision is described. 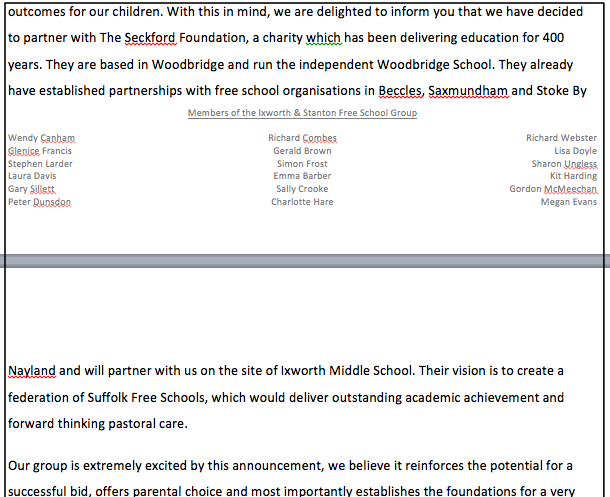 Their vision is to create a federation of Suffolk Free Schools, which would deliver outstanding academic achievement and forward thinking pastoral care. It appears the real plan is to create a Chain of Free Schools across Suffolk. This does not seem to me to be "creating choice" as the schools look like they will all be the same. They have identical websites for example. They all offer an identical narrow curriculum. Given the controvesy around the Ixworth proposal and the fragmented support and opposition to the free school in the North and South of the Thurston area it seems a very brave decision indeed by the Seckford Foundation.